The winds were blowing 15mph from the west when I arrived at 5:00pm so I turned on the classical channel and took a little nap. At 6:15 it had shifted to the NNW and come down to 6 to 8mph. I drove to the South East end of the field and set up. The launch was very sloppy. I had filled the tires to 25 pounds and I think they were bouncing me up into the air. At one point I popped about 2 feet up and the buggy was twisting, rather than come down out of alignment I pulled some brake and climbed out slowly. Remember to let some air out before the next flight! If the buggy is having a hard time getting started, try laying the lift ramp under the back wheels. Once up, the air was moderately bumpy, I remembered that Greg Boulton had said it was very bumpy over the golf course so I stayed inside the perimeter of the field. 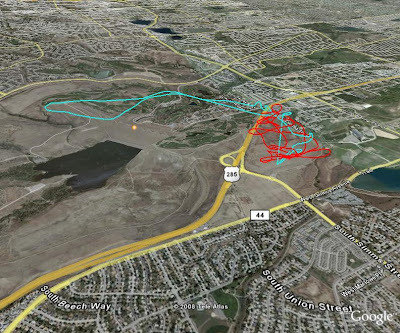 At 400 ft AGL it was blowing 15 to 18 and I stayed gentle on the brakes making mostly flat turns. I did one impromptu touch and go…just because it was feeling good. The landing was a bit twitchy but I controlled better than yesterday and killed the motor at 10 feet. Delaying the flare to the last second is the trick because the 28 meter wind landed just as softly as I was doing with the smaller one. Second flight was another ugly launch. When I first powered up, the buggy didn’t want to start rolling and I had to give a little push with my feet. Maybe the tires were sinking into the soft ground because of more pressure. I don’t think so …there is just allot of initial resistant to roll. Second landing was good and I managed to taxi cross wind for 100ft before loosing it to the wind. Glad I flew …Top speed was 43 mph and the wind kept me from being too aggressive but I learned what happens when the tires are over inflated and was able to compare the performance of the 28m with the 26m. The whole flight I felt like the wind was fighting me…like it was pushing me into turns that I didn’t want to make. Wish I had let the trimmers out, I think it would have performed allot better and I would have been more comfortable. Good but not the best. and 2 very short flights…The first was over with one quick lap. I noticed a weed in the risers that was shortening the “A”s. I’ve flown with sticks in the lines before but this time I could see where several lines had been drawn together and the wing was flying noticably forward . I kept a little pressure on the brakes afraid of a forward collapse. I was very concerned about deflation and so made a slow flat turn to the left (the side the tangle was on) and landed downfield and upwind. The second flight was just plain bumpy and more of a test flight than anything else. Paul Dillon took a short flight and tweeked his cage. Greg Boulton came out and got in a couple of flights. Strong pilot, his second landing was into 10 mph air and beautifuly done. He was being twisted pretty good but still managed to land within a few feet of his truck. I had a little ossolation during one of my landings but it seemed to come in smooth and I was still able to taxi up to the truck. The broken ground wire is repaired and the spade connectors are protected with a blob of high temp silicone. The silicone will act as a damper to keep the vibrations down and prevent the spades from breaking again. Paul Dillon and Marek were at the field when I arrived. Very light winds…I blew the first launch like a rookie. It came up crooked and because I was going by feel instead of looking at the wing it was dragging the left side by the time I aborted. The second attempt was even more stupid. The buggy was slowed down by the terrain and the wing got locked into the prop wash turning me into a big “Push me-Pull you”. On the third attempt I got up with a little brake and immediately went into a climbing spiral. It felt great! 30% of bank and 40/m / minute of climb. Second flight took two attempts because I aborted after spotting a bunch of vegetation in the lines. Too bad because I recovered once after a 40% collapse and pumping out the subsiquent cravat. The wing was flying at 30 mph in calm air with trimmers out. Fast wing! Paul got in a couple of flight and Marek stayed on the ground to help Paul. This was a “strange air” day, it wasn’t really bumpy but the air had lots of cross currents. For instance I would be starting a relatively flat turn that would turn into a steeply banked downwind hook. The take off runs seemed to be longer than normal and I had to use a little brake on every flight to get off the ground. A couple of times I got into sinking air when I was inside the perimeter of the power lines and had to turn away to keep from frying myself. The capper was the third flight when I came in for a low and slow fly-by. I floated over the LZ for about 75 feet and punched it to climb out. The engine had come up to about 8o% thrust when the motor died without a burp. I damped the surge and came down softly. One thing I have noticed about the 26 meter wing is that the landings are very easy to control. I look forward to seeing if I can do as well with the 28 m.
The problem with the motor turned out to be one of the three spade connectors that come out of the bottom of the starter housing. Fortunately the one that broke was a redundant ground wire so i was able to disengage the Master Kill circuit and route the ground to it’s connector. Marek and I met at Titan only to be met by the “Landowner” he has had a change of heart and we are no longer welcome. He had no complaints…there have been no problems…no major incidents or injuries. It’s Just, ” No Mo Fly Boys Allowed”. Rather than waste anymore of the evening trying to plead our case, we packed up and hustled over to the Simms LZ. It worked out well because Chip W and Dan K. were already there and looking at the sky. Chip was grounded because his wing was in the shop after an extended vacation in Hawaii. (poor guy). Worked out well because I was able to lend him my 28 and I flew the 26. My worries about how it would fly at 6000ft were groundless. It came up fast and flew even faster. I noticed a little longer run out but with a touch of break it climbs out nicely. The most notable moment was when Marek was taking off . I was watching from about 80ft comming up from behind at his 8’oclock. Marek was starting his take-off run and 50 feet ahead of him Chip was getting ready to start. He popped some brake to lift off and almost immediatly began to drift back down, when he was alongside Chip his prop started cutting the grass and I saw a puff of dirt. Luckly he was able to stay airborne but the prop strike startled Chip who was just beginning his forward. I’m not exactly sure what happened but Chip ended up falling backward and going turtle while Marek managed to climbout and fly. Mean while Dan cruised around all of us in his speedy little Spice.